An event is anything that is associated with a date, which means a name + date are the bare requirements when posting to the calendar. Name: (Required)This will be displayed as the event’s name in the main listing and on corresponding details pages. After you have entered the event’s name, Localist may display a future duplicates warning below the field, which will detail if there are any possible matching events either in the past or future.It’s a substring match, so if there are three characters in a row anywhere in the title that match an event currently in the system, the warning links will be displayed. Description: No character limit. Embedding and HTML is available only to admins. Start Date: There are several ways you can enter a date: Oct 3, October 3, 10/3, “Next Friday,” “Tomorrow,” 10/3/14, etc. As you type the date below the field will update accordingly. Start / End Time: Use “6pm,” etc. Events do not require these times, but if there is an end time then there should be a start time. Recurs: By default events are set to never recur, but you have the option of daily, weekly or monthly. See Recurring Events article for more information. You can either select to manually enter a place name + address (use: option) or you can select a place landing page, which will automatically pull in the saved address. Use: By selecting this option, you will not be connecting a place landing page and will instead be using a custom location. If User is not displayed before the name then this means that what is listed is a place landing page and is available for connecting an event. If only text is entered in the field and a use or landing page option is not selected then Localist will save the text as is for the place name. If you select to use a custom option, such as Use: Centennial Hall, as shown below, then fields for Address and Directions will appear. Room: This can be words or numbers. Hover over the gray square and a Edit Photo button will appear. Upload Photo will pull from your computer and Browse Library will open a small window to browse previously uploaded photos (this pool is not searchable). Filters: Select all that apply. Custom Fields: If you have added custom fields to your platform they will be listed after filters. Tickets & Registration can be found in the tab at the very top of the "Add an Event" page. Ticket URL: This can be any URL. If a price is entered for ticket cost then this button will display Buy Tickets, but if there is not cost or the event is free then this button will display Register. Keywords: This field can be used for SEO purposes or for hidden tagging for widget purposes. These are not displayed publicly. Twitter Hashtag: When entered, Localist will monitor mentions of the hashtag on Twitter and take mentions into consideration in the trending algorithm. Do not include the hashtag as it will automatically be added. Note: Only one hashtag can be used. Event Website: This can be any website. Facebook Event Page: Linking to a FB event page will allow Localist to automatically pull in and display RSVPs to the FB event on the Localist event details page. Vanity URL: This will give your event a custom URL. Owner: This field will display the email of user who created the event. If ownership needs transferred, the email just needs changed to the new owner’s email. Note: Events that are added via a bulk upload or feed do not receive an owner. Sponsored: This flag forces an event to appear in the trending list on your calendar homepage and will apply different styling so it stands out. Allows User Activity: This is checked by default. Unchecking this disables comments, reviews and user-added photos. Allow User Attendance: This is checked by default. Unchecking this disables the “I’m Going” and “Invite Friends” functionalities. 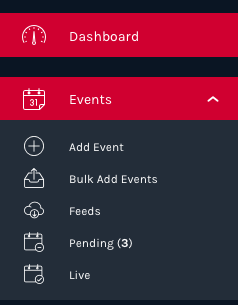 Visibility: Events can be visible to everyone, visible only to users who are logged in, or 100%hidden from the calendar. Venue Page Only: The event will only display on the place’s landing page. Exclude from Trending: Checking this flag will prevent an event from appearing in the trending list. Once an event is saved, the form will show that the event is Verified.